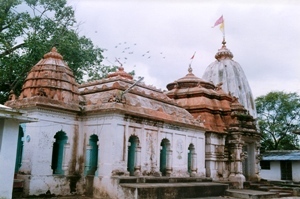 Suvernameru temple was built by the chauhan rulers.It is situated on the left bank of river Tel towards the southwest of the confluence of river Mahanadi and Tel. It stands slightly on the outskirts of the town proper. 'Suvarnameru Mahadeva' has been the presiding deity of the shrine since a very remote time.Scholars opine that the temple was built by Maharaja 'Madan Gopal Singhdeo (1630-1660AD) while some other scholars opine that it was built during the reign of his son Maharaja 'Lal Saheb' (1660-1680A.D. ).While the shrine that date backs to much older period and folklore suggest that the temple was built by the Somvasis in around 9th century A.D.Whatever be the history of the temple, it is one of the most important as well as the most active temples of the region.Suvarnameru Temple is located at Sonepur, in Odisha. It is situated on the left bank of Tel River towards the south-west of the confluence of Mahanadi River and Tel. The presiding deity here is Lord Shiva, known here as Suvarnameru Shiva. Sonepur is situated on State Highway 14 leading to Bhubaneswar from Balangir. Balangir Railway Station is the nearest railhead.